Hospitals are full of sick people wanting to get better, so having the cleanest surroundings possible is crucial. Germs like sickness and sickness likes germs. They feed off each other. Keeping hospital rooms and common areas clean with regular housekeeping services is healthy for patients, visitors, and hospital staff. Some diseases can spread like wildfire. 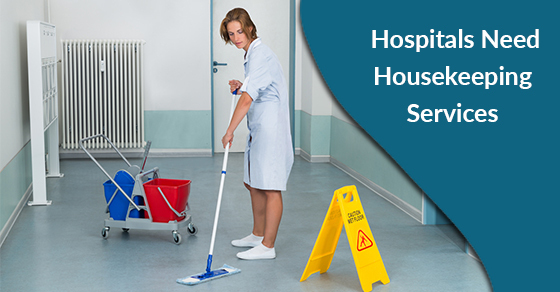 Housekeeping services in a hospital help to control the spread of those diseases. Bacteria is hearty. It can survive in nearly every place and space. It can be found on bedrails, curtains, call buttons—everywhere. And it survives for a long time. If someone touches these surfaces and fails to wash his or her hands, the bacteria spreads to every area he or she touches. In fact, “superbugs,” or antibiotic-resistant bacteria, can survive for months on surfaces. These potentially deadly pests have also found their way into hospitals. To keep a healthcare environment like a hospital free from infections, cleanliness is paramount. Having housekeeping services staff working hand in hand with other staff and patients can keep infections out. Housekeepers play an essential role in the overall environmental health of a hospital. Cleaning and disinfecting aren’t the same at all. Cleaning should happen before disinfecting. When housekeeping staff clean, they use soap, water, enzymes, and a scrubbing action to remove dirt, dust, and foreign matter from objects. Disinfection won’t be adequate if the cleaning isn’t up to par. As a rule of thumb, hospital housekeeping services usually use this formula when cleaning: No smudges, no dust, no odours, no spots equals clean. Disinfectants are used to sanitize clean areas. Sanitizers are usually chlorine, phenol or iodine based and are usually used in food prep locations like kitchens where food-borne pathogen levels must at safe levels. In recent years, healthcare professionals and patients have seen an increased risk of diseases like typhoid, cholera and hepatitis B. Prevention of infection with these and other diseases is tantamount in a hospital. Housekeeping services staff realize these threats are increased if the hospital environment isn’t kept as clean and as sanitized as possible. They have one of the most important jobs in a hospital setting.